LATHERFX is small and easy to use. 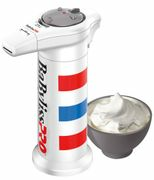 This instant lather machine fits most brands of shaving cream/gel in 7 oz. or 10 oz. cans. LatherFX gives you a smooth and comfortable shave. This is one shave you must try!